As an e-commerce business, you have a lot of competition. With big-name retailers taking over the digital world, it’s harder than ever to establish yourself as a presence online. Customers are leaving in-person stores behind and e-commerce businesses are ready to meet them. From groceries to exotic vacations, just about anything you can think of can be purchased online nowadays! In the online age, it’s not enough anymore to have a website for your business. You need to have the right presence to stay ahead of big-name brands and industry leaders. If you want to be competitive online, you need the right strategy. Here are 7 tips for improving your e-commerce strategy. Why Focus on E-Commerce Strategy? Why is your ecommerce strategy important as a business? Ten years ago there weren't nearly as many e-commerce businesses as there are now. In those days all you had to do was set up a website for your business and customers would come! Now, that’s not the case. E-commerce businesses are fighting for customer attention across all platforms. While there are more and more customers shopping online, there are also more e-commerce businesses than ever before. No matter your industry, you’ll have fierce competition. You’re competing not only with businesses your own size, but also big-name brands that have a lot of money to invest in their own strategy. The good news is you can use your size to your advantage. As a smaller e-commerce business, you have the time and energy to devote more strategy to the customer experience. You can really push the boundaries of e-commerce to capture users’ attention and reach new customers. Well-known selling platform Shopify analyzes the big trends in e-commerce for 2018, saying social media and mobile phones are leading to big changes in the industry. Are you ready to meet these new challenges with your own e-commerce business? Then keep reading for top tips! According to Tesco Solutions, e-commerce sales are expected to be over $491 billion in 2018 alone. That’s a number you can’t ignore, and it’s no wonder so many businesses are competing to make a profit off these online shoppers. New e-commerce business owners will quickly learn it’s not as simple as setting up a website and purchasing some ads. It starts with the right merchant account. While in-person businesses worry about card machine costs & fees, e-commerce businesses need the right merchant account and platform to ensure a smooth checkout process. Video is changing the way people interact with content on the internet. Video does well both on e-commerce websites and on social media. Showcase your best products in an eye-catching fashion on social media with striking videos. Let customers see a product through video on the website before they purchase. Kissmetrics notes one of the main things customers look for in an online shopping experience is an ability to clearly see products, and video helps fill in these gaps. Along with video, photography is becoming a bigger component of online selling. Nothing will kill a brand faster than bad stock photos or mediocre photography. In the age of Instagram and Facebook, anyone can be a photographer. That means the standards for online video and photography are rising rapidly. As a business, high-quality visuals need to be a priority. Think beyond traditional photography and include things like 360 degree images, gifs, or even virtual reality. Changes in technology make it easier to capture quality photos and videos on a budget. You can even use your smartphone if you use the right technique! There are a lot of marketers who will try to tell you that email marketing is dead. Luckily, this isn’t the case. E-commerce websites need to be willing to adapt their email marketing strategy to work in this new digital age. The spammy, sales-based emails of yesterday are no longer effective. If you want users to actually read your emails, make sure your message is worth opening! According to Digital Marketer, you only have 4 seconds to capture users’ attention in a single email. How will you make those 4 seconds really count? The best way to capture attention (and keep it!) is through a catchy, interesting headline. Your customers get a lot of emails on a daily basis. How can you get them to actually pay attention to yours? When writing emails, the focus should be all on value. This isn’t a time to deliver your greatest sales pitch. People know when they’re being sold to, and they’ll quickly click away to something else. Instead, think of your emails as a way to get to know your audience. You want to build a relationship with your email list. Once your audience trusts you, you can start talking about your products or sales. Until them, lead with value! Like with most aspects of marketing, you’ll need to do a lot of testing to understand what aspects of email marketing work best with your audience. As long as your sending quality-driven emails regularly, you’ll see growth in your e-commerce site conversions rate! More shoppers are choosing to make purchases over their phone than ever before. As smartphones and tablets become more commonplace and complex, they’re starting to change the way people shop. If your website isn’t optimized for mobile, you’re losing customers. 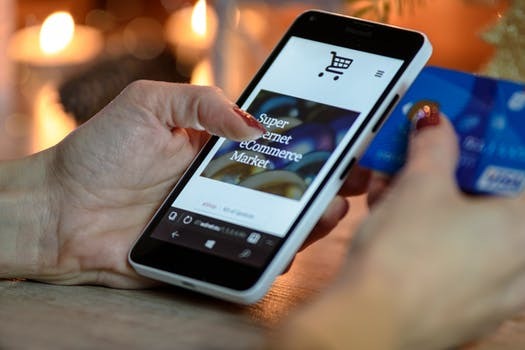 Luckily, most designs and platforms for e-commerce websites are optimized for mobile nowadays, but that doesn't mean things can’t still go wrong. Test your website with different screen sizes to ensure everything works perfectly no matter what device your customers are using! TechnologyAdvice.com reports people are more likely to shop at stores with loyalty programs! Reward your best customers with a loyalty program! You don’t want your customers to buy something from you once and never again. The goal for e-commerce websites is repeat business, and loyalty programs breed just that. If your customers are having a positive shopping experience with your e-commerce website, don’t give them any reason to shop elsewhere. Not sure where to begin with your e-commerce loyalty program? Start simple. You can go basic with your program by offering a money-off system. For instance, your customers can earn $10 off for every 50$ they spend! Another simple option is an email rewards program, where members of an email list can receive access to unique sales or discounts! Both of these options are simple and keep customers coming back again and again. Don’t put all your marketing eggs in one basket. There’s a world of opportunity available for you to market your business effectively. If you’ve had success with Google Ads, try Facebook Ads. One of the reasons so many new businesses fail to see online growth is because they never expand their marketing strategy. You have to be present online in the right places! Really get to know your audience. What type of content do they like to interact with? These are the questions that should lead your platform search. If your target audience isn’t interested in Snapchat, don’t spend valuable marketing strategy time building your Snapchat account. If you don’t find success with one platform, move on to the next until you hit that sweet spot! Social media is changing the way people interact with businesses. Be more than just a store by interacting with customers on social media. Customers don’t want to feel like they’re buying from a computer or a robot. Even though the shopping experience is transitioning from in-person to online, people still crave human interaction! Give them this interaction by creating genuine connections on social media. Interact with your audience with engaging, unique content that really stands out from other businesses. Highlight your best products and sales while actually creating high-quality content for potential customers. This will build vital trust that will convert more followers into buyers! As an e-commerce business, you need to be willing to adapt quickly to stay ahead of the competition. Things change quickly in the digital space. E-commerce might be taking over the sales industry, but it’s still very much a wild, wild west of strategy. There are no hard and fast rules. The big brands didn’t get to the top by following trends! Be a rule breaker with your e-commerce business if you want to be noticed. There is a lot to look out for in the coming years of e-commerce. Right now, your strategy should be on creating high-quality, engaging content and finding new ways to interact with your customers. In the future, the focus is likely to shift to things like community involvement, machine learning, and even cryptocurrency! Be proactive with your strategy. Be on the cutting edge of change if you want to see real results. Most importantly, remember to keep the focus on the customers. In this constantly changing digital landscape it’s easy to forget about your customers and think about your business. As long as you’re working for the customer, you’ll see your numbers grow no matter what!